Let Toshiba take care of all unexpected repairs worldwide. Extend your standard warranty for up to 3 years to guard against unexpected repair costs after your original product warranty expires. - Period: Valid for 3 years starting from the purchase date of your Toshiba product. - Compatibility: Compatible with Toshiba Tablets, Netbooks & Librettos. - Purchase Period: Service can be purchased within the whole warranty period. 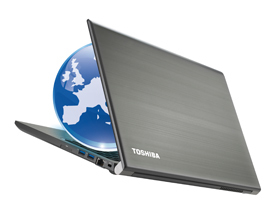 - Country Coverage: All countries where Toshiba has an Authorised Service Provider worldwide. - Activation: The service needs to be activated within 30 days following procurement. - Availability: Monday to Friday from 9 a.m. to 5 p.m. local time, excluding public holidays. - Obtain: Select your country and call your local Toshiba Support Centre to obtain service . - Features: Includes Worldwide Coverage.